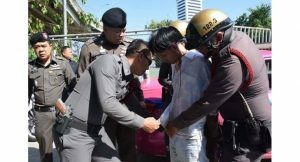 A taxi driver apparently under the influence alcohol was arrested near an expressway entrance after he hit a motorcycle and fled the scene, prompting good-Samaritan taxi motorcyclists to chase after his cab. During his attempt to flee, Sakchai Nomrawee, 49, fired one shot from a .38 revolver at the three motorcyclists pursuing him. 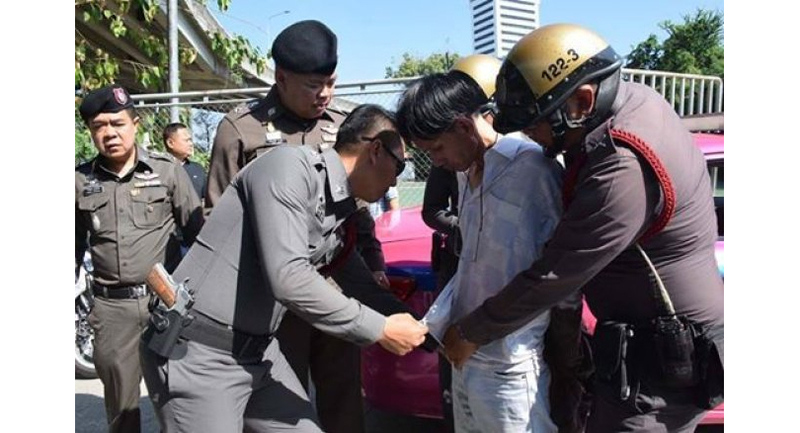 Sakchai was arrested after his taxi hit the pavement while he was trying to enter the Rama II entrance to the expressway in Bangkok’s Jomthong district, causing the vehicle’s front left tyre to burst. He was arrested at 10am after he climbed over the fence of the expressway and tried to hail another cab. Police arrived at the scene shortly after the Ratburana police station was alerted of the hit-and-run and shooting incident at 9.30am. Police found a .38 revolver in his car with 14 rounds of ammunition and a spent shell. Pol Major Gen Samrit Tongtao, commander of the Metropolitan Police Division 8, said police were informed that a taxi driver appeared very drunk and his taxi had hit a motorcycle belonging to Wannisa Kadprasit on Soi Suksaswat 38, causing her son, Pornprasit Kadprasit, to suffer a head injury. The taxi sped off from the soi towards the Rama II road, prompting the three taxi motorcyclists, who witnessed the incident, to give chase. Samrit said Sakchai fired his gun once at the motorcyclists, who were closing in on him, but nobody was hit.